Waka was released at the Hunt’s pine forest on Robinson Road in September 2010 as a 1 year old. He walked over Taurikura Ridge and settled into the McKenzie Bay area and spent his time maturing there. 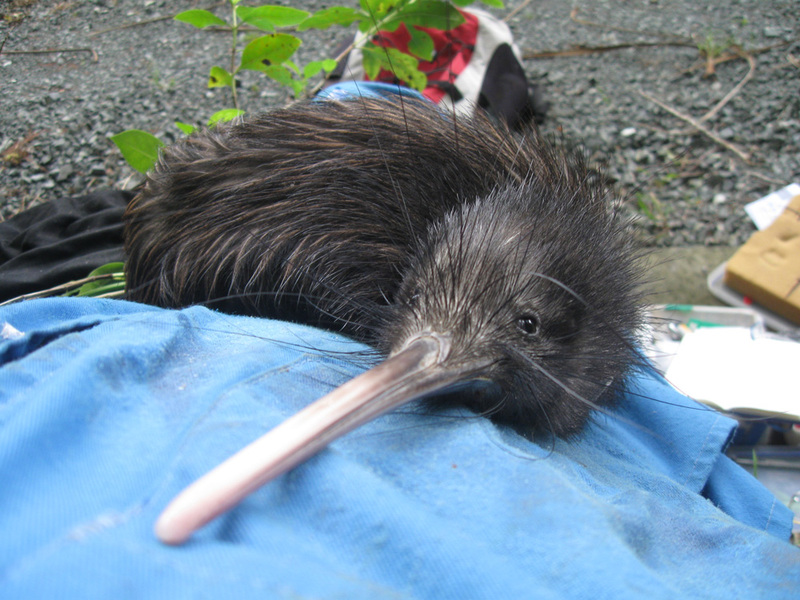 He must have been an early developer because he was found with a local adult female kiwi in the winter 2011 – she was named “Charlotte”. 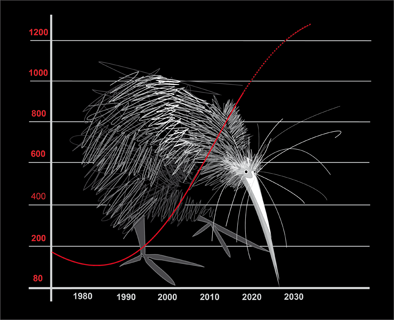 Most kiwi take 3-5 years to mature to breeding and he was only 2 years old then. After a few false starts the pair successfully hatched two lots of two chicks in 2013. These two kiwi spent their time on both sides of the road at Mckenzie Bay, mainly in the pampas areas. For some reason Charlotte wandered slightly south at Christmas 2013 and unfortunately drowned in an uncovered water tank in a backyard there. Since then Waka has remained in his usual area but doesn’t seem to have found a new mate. Let’s hope he finds a new girl soon. After finally nesting after a year not breeding the nest failed at about 50 days. 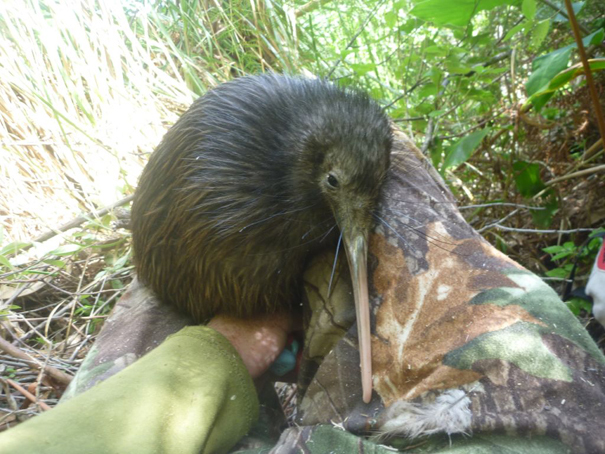 Unfortunately Waka had been due a transmitter band change but I was unable to do it while he was nesting and shortly after giving up on his nest the band wore out and he dropped his transmitter in the pampas on the McKenzie Bay corner. So Waka is out there doing his thing but we won’t be monitoring that activity now. The good news is that he as finally nested again (after losing his first mate to drowning in an uncovered water tank almost 2 years ago). I have narrowed down his nest location to the gorse/pampas area just past the last houses at the south end of Taurikura Bay. Unfortunately his activity data shows 6 hours nightly activity at day 56 of nesting – so his nest could be failing. In his usual area at Mckenzie Bay. The very good news is that he as finally nested again (after losing his first mate to drowning in an uncovered water tank almost 2 years ago). He is nesting on the point between Taurikura and McKenzie Bays. Hatch is due early January. The very good news is that he as finally nested again (after losing his first mate to drowning in an uncovered water tank almost 2 years ago). He is nesting on the point between Taurikura and McKenzie Bays. In his usual area at Mckenzie Bay. His nightly activity is still high at an average of 10.5 hours. Not looking like nesting yet. In his usual area at Mckenzie Bay. His nightly activity is still high at an average of 11 hours. Not looking like nesting yet. In his usual area at Mckenzie Bay. His nightly activity is still high at an average of 12 hours. Not looking like nesting yet. Usual area at Mckenzie Bay/Taurikura point. His activity is 11 hours per night. Usual area at Mckenzie Bay/Taurikura point. His activity is 10 hours per night – He is already in great condition so hopefully he will find a mate. At Mckenzie Bay/Taurikura point. I caught up with him in a hollow puriri tree near Peterkins’ drive for his annual transmitter change. He hasn’t found a new mate and consequently hasn’t nested so is in a very fat condition-weighing a whopping 2850g – a full 1 kg up on his usual post nesting weight. Waka – Usual area at Mckenzie Bay/Taurikura point- activity is 8 hours – he is due a transmitter change but he is holed up in a dense gorse patch at the moment. Mckenzie Bay – no sign of nesting. He is still moving between Mckenzie Bay and the pampas on the peninsula at the south end of Taurikura Bay – Activity ranging from 7 to 9 hours but he still hasn’t started nesting! He is still moving between Mckenzie Bay and the pampas on the peninsula at the south end of Taurikura Bay – hopefully he will find a new mate soon. He is moving between Mckenzie Bay and the pampas on the peninsula at the south end of Taurikura Bay. I gave him his 6 monthly check recently and he was a fat 2950g – he really does need to find a replacement mate and put that body weight into nesting! 11.5hrs and moving quite a bit. He may be looking for replacement mate for the drowned Charlotte. High activity of 11 hours a night at McKenzie Bay. High activity of 11.5 hours a night at McKenzie Bay. High activity at McKenzie Bay. Caught up with him at McKenzie Bay for his annual transmitter change. He is in good condition even after nesting twice in a dry summer and was 2110g in weight. Locals have heard a new female near by – so hopefully he has found a new mate after losing Charlotte. it without risking squashing the chicks so didn’t get to ID chip the chicks. Also a wasp nest there wasn’t much fun. Still on second nest. 1st egg hatched on 18/12/13 – still waiting for activity to increase before going into nest. On his second nest at Mckenzie Bay – 10m from the landowner’s washing line! After hatching 2 chicks last month (which we need to name) he fell for Charlotte again and is re-nesting already too! The nest is in a pampas bush in a landowner’s back garden. Takes the title of first recorded hatch of the season- 1st hatched 13/9/13 and a second a week later. Both chicks were in the nest late September and I caught up with them to DNA sample and ID chip. Usual area Mckenzie Bay – nesting – 3.5 hours activity– 65 days on 4 September approx. Usual area Mckenzie Bay – nesting – 65 days on 4 September approx. Usual area Mckenzie Bay – activity of 10 hours per night. Usual area Mckenzie Bay – activity of 12.5 hours per night. Usual area Mckenzie Bay – activity of 11.5 hours per night. Had his transmitter changed because of a suspected intermittent fault in his old transmitter. He was in the pampas by the road at Mckenzie Bay. Came back on the radar!!! After no transmitter signal since 18/10/12 when he was nesting in Mckenzie Bay. The transmitter data stream indicates that he hatched a chick – the transmitter must have stopped sending a signal for the past 2 months! 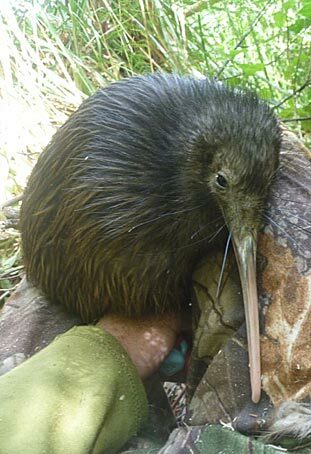 Unfortunately Waka’s transmitter has failed – hopefully he is doing ok at Mckenzie Bay.